Kenneth Lowe marvels that, old, fat, and ill-behaved as he is, Stephen Seagal is still able to keep making lots and lots of really terrible movies. 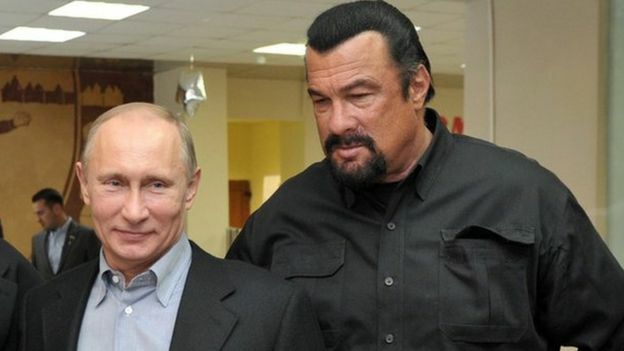 Since his falling out with Warner Brothers, Seagal has become an unbelievable workhorse, albeit one who shows up to maybe a few days of filming and looks terrible. With the exception of the couple of years he was doing his reality show and another TV series, he’s put out two if not at least three pictures per year since 2003, almost all of them direct-to-video. I haven’t seen one scene in any of them where he can convincingly throw a punch. He will never stop making them, because they will never stop making money, because his own salary is probably the largest expenditure of anything involved in the production. It certainly isn’t lighting or locations. That’s the final paradox of Seagal. He cranked out more movies last year than Jude Law at his height, yet he’s the laziest actor imaginable. He puts people in real bodily danger by his very presence, yet he walks free and enjoys celebrity. He can’t throw a punch in fewer than three cuts yet he’s immune to shame, Man’s oldest weapon. A tea ceremony master was walking through the town market one day when he accidentally jostled a samurai. The samurai took great offense, but because the samurai and the tea ceremony master were of the same social caste, the samurai could not simply lop off the tea ceremony master’s head. So the samurai challenged the tea ceremony master to a duel the following dawn. The next morning at dawn the tea ceremony master stood at one end of a bridge and the samurai arrived at the other. 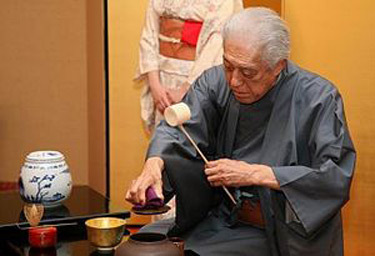 The tea ceremony master held up his sword as he had been shown and thought of the tea ceremony. The samurai watched the tea ceremony master for a good while. Finally he bowed, turned, and walked away. 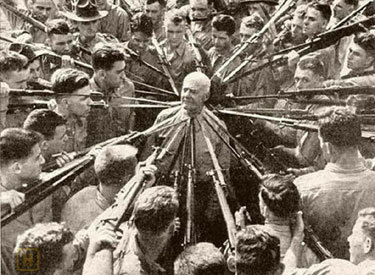 Col. Anthony Joseph Drexel Biddle, hand-to-hand combat expert, 1943. Known for ordering trainee Marines to attempt to kill him with bayonets, and disarming them all. 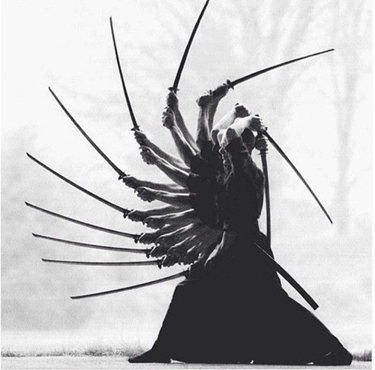 Isao Machii is so skilled with the Japanese sword that he can draw his blade and cut a BB fired at him in two. It’s always better to listen to the referee. Remember how, in Kill Bill 2 (2004), Beatrix Kiddo (Uma Thurman) is able to break out of the coffin in which Bud buried her alive by smashing its boards, despite having only a few inches of arm room to throw a punch? Fortunately for Beatrix, her Si Fu Pei Mei had taught her Kung Fu rigorously, making her break two-inch boards starting the blow only an inch away from its target. Terrence McCoy, in the Washington Post, reports that scientists are attempting to explain how Bruce Lee could do the same kind of thing… in real life. 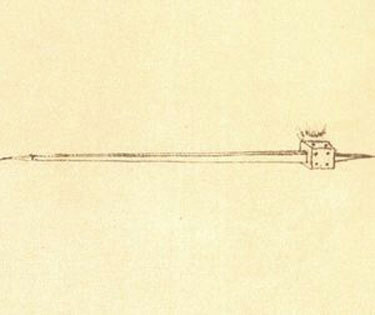 It’s a punch that has captivated our imagination for decades. From the distance of one-inch, Bruce Lee could break boards, knock opponents off their feet and look totally badass doing it. It’s one of the most famous — and fabled — blows in the world. Days ago, Popular Mechanics set out to solve the mystery behind it – and did. Drawing upon both physical and neuro power, Lee’s devastating one-inch punch involved substantially more than arm strength. It was achieved through the fluid teamwork of every body part. It was his feet. It was hips and arms. It was even his brain. In several milliseconds, a spark of kinetic energy ignited in Lee’s feet and surged through his core to his limbs before its eventual release. Scientists advise that you watch Lee’s movement closely. If you do, you’ll see every part of his body move. …Every bodily jerk has an apex of force. To not only maximize on that force — but to augment it — Lee perfectly synchronizes his movements, one after the other, linking them like boxcars on a train. To be sure, countless muscle men have been stronger than Lee, but few, if any, could deliver more more power than Lee with just one inch. What makes the difference? Lee’s brain. To understand why the one-inch punch is more about mind than muscle, you first have to understand how Bruce Lee delivers the blow. Although Lee’s fist travels a tiny distance in mere milliseconds, the punch is an intricate full-body movement. According to Jessica Rose, a Stanford University biomechanical researcher, Lee’s lightning-quick jab actually starts with his legs. “When watching the one-inch punch, you can see that his leading and trailing legs straighten with a rapid, explosive knee extension,” Rose says. The sudden jerk of his legs increases the twisting speed of Lee’s hips—which, in turn, lurches the shoulder of his thrusting arm forward. As Lee’s shoulder bolts ahead, his arm gets to work. The swift and simultaneous extension of his elbow drives his fist forward. For a final flourish, Rose says, “flicking his wrist just prior to impact may further increase the fist velocity.” Once the punch lands on target, Lee pulls back almost immediately. Rose explains that this shortens the impact time of his blow, which compresses the force and makes it all the more powerful. By the time the one-inch punch has made contact with its target, Lee has combined the power of some of the biggest muscles in his body into a tiny area of force. But while the one-inch punch is built upon the explosive power of multiple muscles, Rose insists that Bruce Lee’s muscles are actually not the most important engine behind the blow. 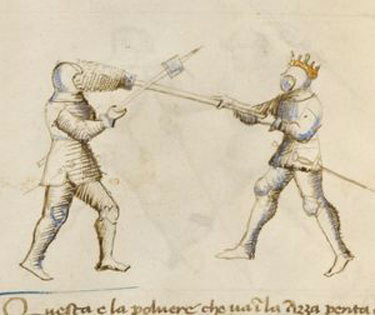 In Kendo, you shout “Men!” as you strike at the head. the Archives of Never Yet Melted in the 'Martial Arts' Category.